High Oaks Dental Practice, St Albans, provide a full range of teeth whitening products, to help create a brighter, whiter smile. This blog will help identify how teeth become stained. Our following blogs will deal with how to rectify these discolourations and restore the teeth and your smile. Discoloured teeth can occur in a variety of ways. 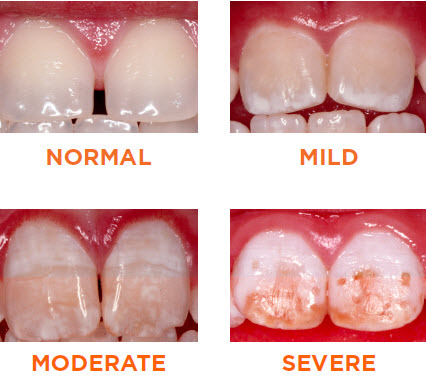 Teeth can either be discoloured from when they develop, they erupt or in the early stages after eruption. Fluorosis – this is a condition where developing teeth are exposed to excess fluoride. If this excess fluoride is mild then white spots/marks can appear on the teeth when they erupt. 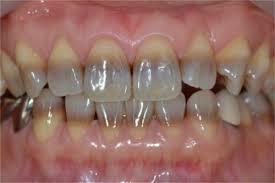 If the amount of fluoride is greater then this can turn into brown spots on the teeth and give a ‘mottled’ appearance. Tetracycline staining – this condition is where the developing teeth have been subjected to tetracycline, an antibiotic, which causes a brown ‘band’ to be present on the teeth. This is now very rarely seen and treated minimally invasively. Trauma – direct or indirect trauma to a tooth can cause the pulp in the tooth to die. The death of a tooth can result in a fast colour change, changing a tooth from white to dark yellow/brown to black. If someone notices the colour of a tooth changing as a result of a trauma then they are advised to see one of our dentists as soon as possible. The earlier we treat this tooth the better the cosmetic result will be. This is the usual staining we encounter at the practice. This is where the enamel has picked up staining from tea, coffee, smoking cigarettes, red wine, curries and long-term usage of Corsodyl mouthwash. Being a superficial stain, it is usually cleaned by our hygienist over a 30 min appointment which also clears any debris between the teeth called calculus, giving a ‘fresh-breath’ feeling. This is unavoidable and occurs over decades of using your teeth and modern diets. Acids in fizzy drinks erode the enamel, causing it to thin and become more transparent. This makes the underneath dentin more noticeable. Dentin matures over age and becomes more yellow. As a result of the thinning enamel, the yellower dentine becomes more prominent. Our next blog will discuss the different products and options we have to rectify these issues and how successful they are.